Tony Wagner addressed innovation in higher education during his 2013 keynote presentation. Author and Harvard Innovation Education Fellow Tony Wagner told Campus Technology attendees Wednesday that three current challenges will inform how educational technology is leveraged moving forward: The commoditization of knowledge, the transformation of traditional careers and the ability (or inability) to engage today’s learners. “Increasingly, what we see are teachers teaching to tests that tell us nothing about citizenship readiness,” Wagner said. 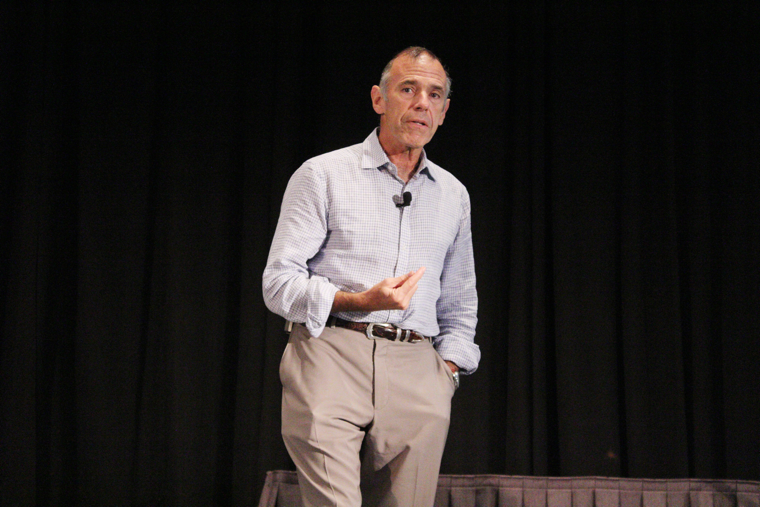 RT @Campus_Tech: Tony Wagner at #campustech:The world no longer cares what our students know. It cares what they can do with what they know. Wagner’s latest book Creating Innovators: The Making of Young People Who Will Change the World highlights his ongoing research into the common traits or patterns of innovative people or creative problem solvers, their parents, teachers and mentors. He told Wednesday’s audience that, in those few schools or higher ed institutions that teach innovation — including the Massachusetts Institute of Technology Media Lab, the Olin College of Engineering in Needham, Mass., High Tech High in San Diego and the New Technology High School in Napa, Calif. — instruction is not only radically different from methods found in more traditional classroom settings, but also consistent with the ways in which his outliers’ teachers or mentors taught. “The culture of schooling as we continue to practice it is fundamentally at odds with how we learn,” Wagner said. “Innovations rarely happen within academic disciplines. They happen at the margins and intersections of academic disciplines. Wagner is a proponent of the use of e-portfolios as a gauge of student achievement within the survival categories he laid out, and agreed institutions should do more to ensure students actually own their portfolio information no matter where they are. In many instances, students who are able to create portfolios find, instead, that they end up becoming the property of the portfolio vendor or university, one audience member pointed out. “Students must own their own records,” Wagner said. He also acknowledged that he has a few reservations when it comes to classroom technologies. “These devices are addictive,” Wagner said, citing a Kaiser Foundation study that reported average children ages 8 through 18 spent from seven to 13 hours daily on devices after finishing their school work. Wagner said that as colleges and universities adjust to their new economic realities and consider their place within the current MOOC environment, they also must consider their collective value-add.